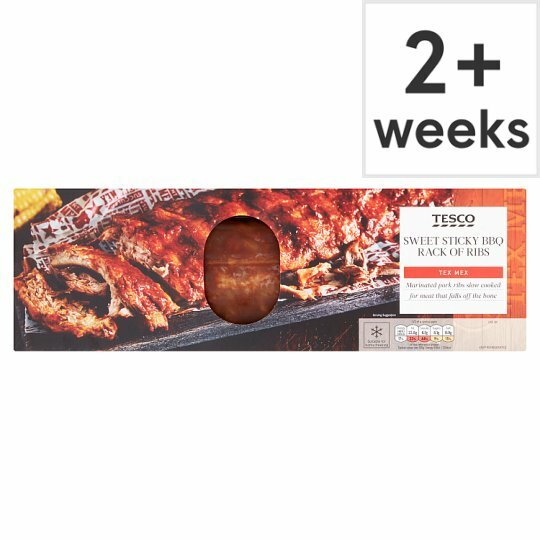 Slow cooked pork rib rack in a sweet barbecue flavour sauce. Slow cooked pork loin ribs marinated in a smoky, sweet and spicy barbecue sauce for a melt in the mouth experience. Instructions: From chilled: 190oC /Fan 170oC / Gas 5 25-30 minutes Decant contents of pouch into an ovenproof dish and cover with foil. Place in a pre-heated oven for 20 minutes. Remove foil cover and cook for a further 5 to 10 minutes. Instructions: Heat as per oven instructions. Allow to stand for 1 minute. Place ribs on the barbecue for 2-3 minutes, turning frequently to avoid burning. Ensure food is piping hot throughout before serving, particularly when using a charcoal barbecue. Warning: This product will contain bones.Take care when uncovering dish as product will be very hot and hot steam may escape.